Wizardry Workshops & Magic Shows Set To Take Over Robina Town Centre These School Holidays! There is something magical brewing at Robina Town Centre! The School of Wizardry is set to cast a spell over the Centre from Saturday 6th-Thursday 18th April, offering a wand-erful line-up of wizardry workshops, magic shows & cupcake decorating classes over the school holidays! 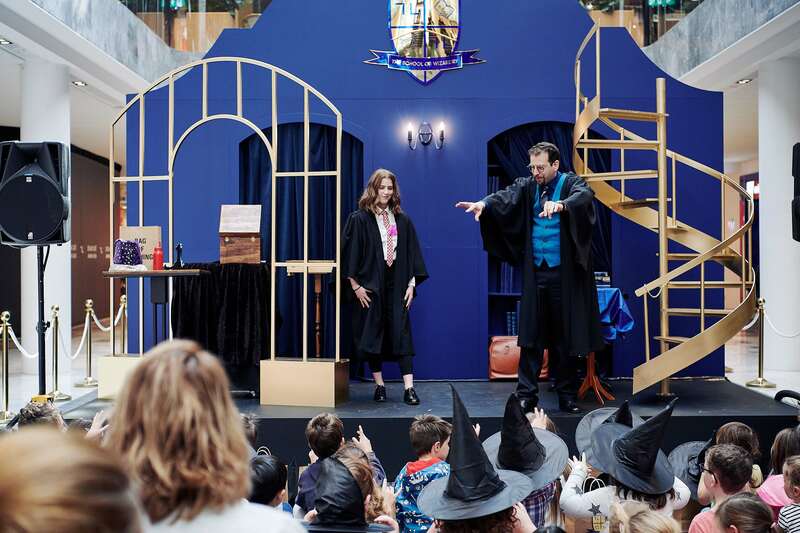 Young witchcraft and wizardry enthusiasts can make their way to the space outside Myer, which will be transformed into wondrous school-style setting straight out of a fantasy novel! There will be bookcases full of spell books, a twisting staircase, school crest and shelves lined with potions, beacons and bottles. This is the best chance for you to wear your favourite robes & wizard hat! Plus, you can't forget your wand and broomstick! There will be daily prizes up for grabs for the best-dressed wizard! Guests will be greeted by cloaked wizarding folk at a train station ticketing booth upon arrival, where they will be ushered into their seats before a skilful sorcerer bamboozles audiences with mind-boggling magic tricks – like making objects move with a wave of a wand; books bursting into flames; and items vanishing and reappearing from thin air. Learning and participation will be encouraged amongst children, with four bewitching workshops taking place outside Myer. The stage will be replaced by class-room style work benches and desks as participants unravel the mysteries of magic and learn the tricks of the trade. Class is in session once students take the magicians oath, reciting the laws of magic around a magical scroll. And upon completion, with the flick of a feather pen on parchment, will be bestowed with a personalised certificate to show that they are ready to take their new magic tricks into the world. The workshops are perfect for ages 5-14! But that's not all, there will also be a Wizards in the Kitchen workshop from Monday 15th-Thursday 18th April at 9:30am, 10:30am, 11:30am & 12:30pm on Level 1 of The Kitchens near Crema Espresso. You can whip up cupcakes in the shapes of wizard and witch hats, magical owls and there will be plenty of edible decorations! You can purchase tickets to The School of Wizardry’s Magic Shows and Workshops through Eventbrite for $10. Wizards in The Kitchens tickets will be $5. All proceeds from The School of Wizardry and Wizards in The Kitchens will be donated to local charity LIVIN.